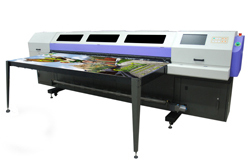 This F1 250UV Turbo UV rigid and flexible media digital printing machine supports grayscale printing technology and its printing speed can reach 38m²/h for standard output. The printing breadth is 2.54m and the printing length is infinite. With dedicated solutions for application, this product is easy to print on the wall paper, advertising cloth and other flexible and light rigid substrates. UV lamp system Dual UV lights, dual shutters control system, the shutter can be controlled independently by software. Every UV light contains two levels of energy, which can be adjusted to meet diverse demands.